What did we do for Dobbes? 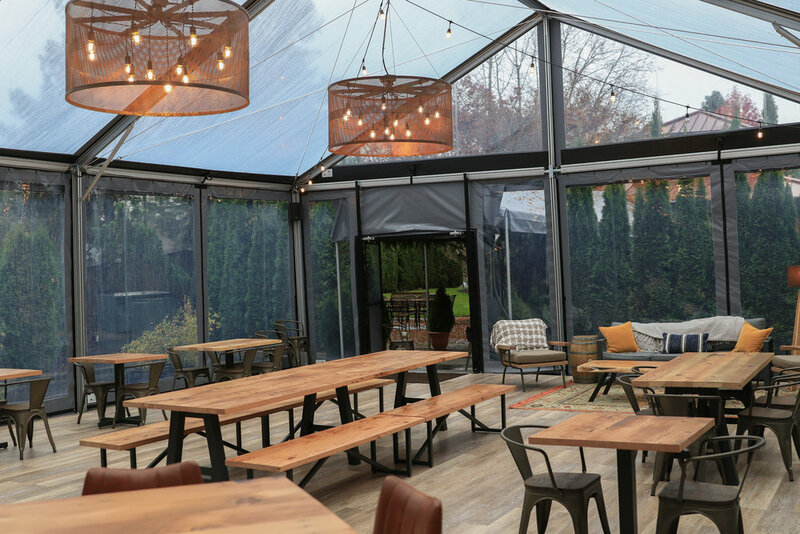 Nestled in the heart of Oregon wine country in Dundee, Oregon, Dobbes Family Estates came to SHELTER in search of creating a new outdoor environment that expanded upon their tasting room and offered a flexible space that could be used year round. We worked with them to design a 30’ x 40’ event tent that would comfortably host 75+ people, allowing customers to engage in several seating and lounge areas while sampling their finest wines from a custom mobile pour station. 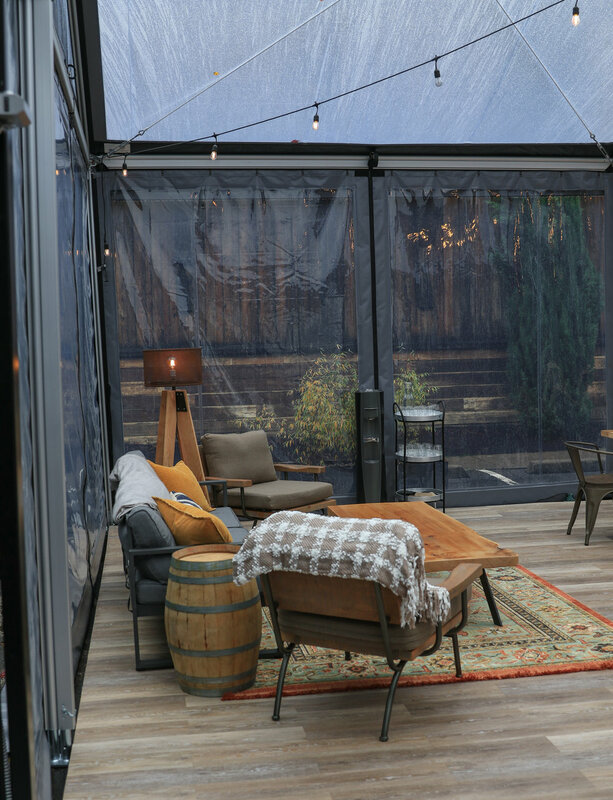 When developing the new space, we strived to keep the outside in yet with a much cozier vibe. The PNW and the hardworking farmers that tend to the vines and land inspired the textures and colors. We blended a rich palette of natural tones and rustic elements in contrast to dark steel accents, often seen in farm environments. Our favorite elements have to be the two 4’ diameter chandeliers. We really wanted the lighting to be a showpiece, so with its oversized stature and hand patina’d finish we felt it really added to the ambiance of the space and connect to the hardworking equipment that you see lying around farm. These large chandeliers are also paired with a corner lamp and wall mount sconce all with matching patina’d shades to add to the warm glow of the space. 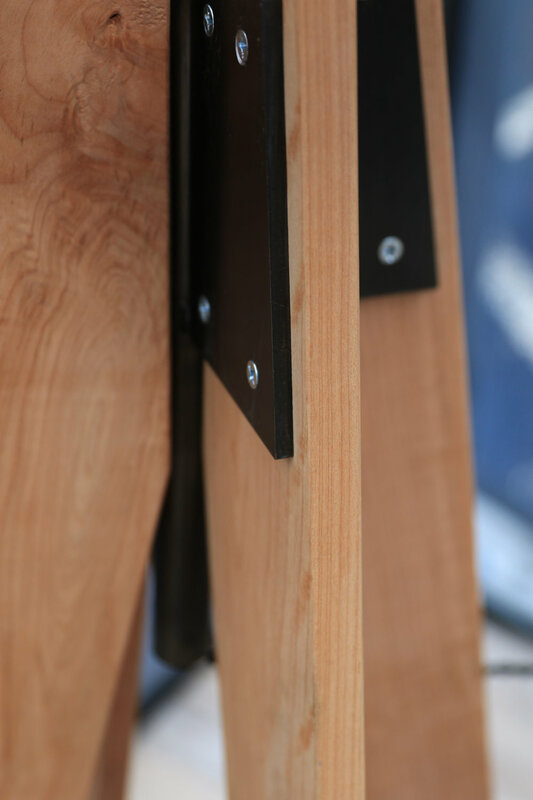 Take a look at the “A-frame” tables bases on the 12’ and 6’ tables as well. They were designed just for Dobbes and add to the heavy industrial look of the space.